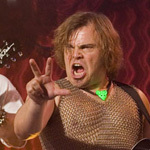 Finally, after many production delays, rewrites and re-shoots, destiny has picked the much anticipated Tenacious D movie, and to fans’ relief, it has picked well. For those of you who aren’t familiar with the self-proclaimed greatest band on earth, Tenacious D consists of JB (Jack Black) on lead vocals and KG (Kyle Gass) on lead guitar. The now legendary duo first appeared on HBO in 1999, performing their two-piece musical acts in an open-mic nightclub setting. Their stage presence is a sight to behold, and the songs are a delightful fusion of energized rock-opera and comic genius that surges instinctively from the two heavy-set musicians. The handful of fifteen-minute sketches was followed by the 2001 release of their self-titled debut album, which piggybacked on the popularity of Black’s acting career. Now a member of the favored “frat pack” in Hollywood, Black is considered an A-list actor, which may discourage some of the old school “D” buffs. Nothing is more clichéd than a discovered artist who becomes too self-aware of himself, ultimately selling out and voiding the very “outsider” street cred that brought him fame in the first place. Thankfully, audiences new and old can share a luscious experience in The Pick of Destiny, an epic musical chronicling the birth of the band and the forging of “the greatest song in the world.” Liam Lynch, failed musician turned director, has finally matured (in a sense) from his amateur shorts and painfully retarded Jesus is Magic, successfully merging the band’s wacky mythology with a touch of realism. Long-time fans of the band will be highly satisfied with the comedy and music, both honored faithfully in appropriate fashion. With all the witty joviality, extravagant musical numbers, and fun cameos, newcomers will probably have a good time too.